Quick settings is the site of major improvements in Android N—there's a new row of five toggles along the top of the notification shade, the quick settings can be rearranged, and you can even add new tiles. The latest Android N Dev Preview 3 brings more improvements and tweaks to quick settings. 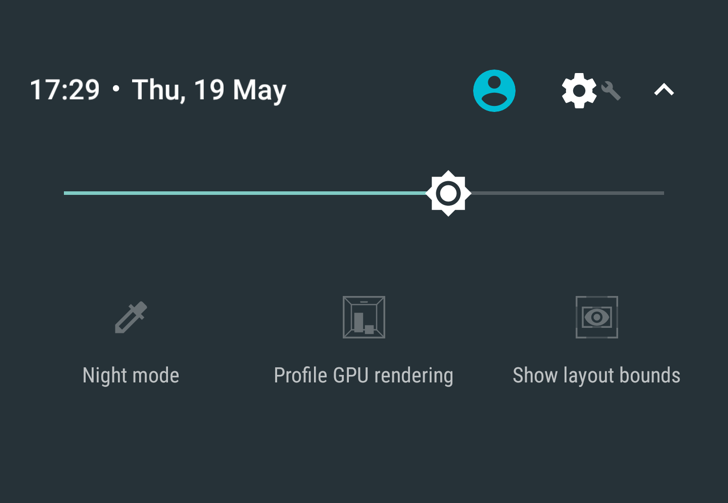 There are now two more developer-focused toggles for "show layout bounds" and "profile GPU rendering." Those features are already available in developer tools, but now they're easier to use. Great, more easily accessible tools for developers, but what about night mode? Many of you have noticed its absence from the System UI Tuner. It still exists for the time being, but not in the System UI Tuner. Instead, you need to use the night mode quick setting toggle (still available to add if you don't have it). Long-press this and it should take you to the toggles for night mode... in System UI Tuner. However, it seems even buggier than before. We can't get the dark theme to flip on, though tinting and brightness are working. You're free to use this method to play around with night mode in DP3, but based on what we now know, it won't be sticking around. We asked Google's Dan Sandler about night mode, and he said it's very unlikely to ship in N. It just isn't good enough yet. So, enjoy this final glimpse until next time. Maybe Android O?